So a book like this is your basic Reggie Bait: DC Comics’ magic characters banded together to fight off horrible demons and ghosts and hopefully Felix Faust or someone like that. This had its shot in the New 52…and it was kind of a mixed bag. And now we’re giving the concept the old college try, one more time! So tap into the hoary realm of black magic and you read my review of Justice League Dark #1, right here! Okay, so you all remember all the stuff that spin out of Dark Nights: Metal and No Justice, right? Something about the Nth Metal opened a Dark Multiverse, then four giant tree-huggers came from the Source Wall to munch on some brand new magic trees that grew out of the earth. If you’ll recall, Wonder Woman led a bunch of magic-users and –abusers to go to the Tree of Wonder and…do something. Look, I don’t exactly recall the details and I’m not positive I understood them wholly to begin with. The short of it is that Diana very much liked leading the team, so she’s getting them back together, beginning with Zatanna. There’s also some kind of dire threat, as one would expect. Something about dead people coming back all mutated, or something. 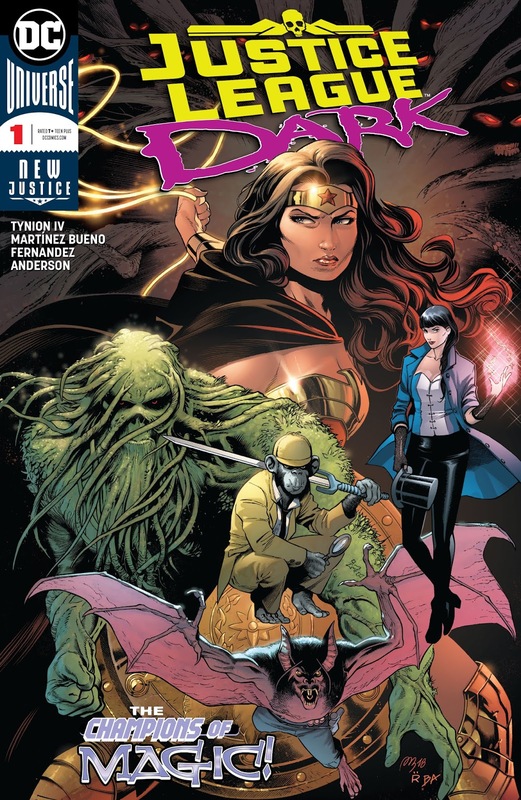 This issue is spent largely recapping past events, and establishing a few things going forward: the Justice League Dark’s base in a mile beneath the Hall of Justice, in a space that looks sort of like aspects of the Museum of Natural History in New York City. 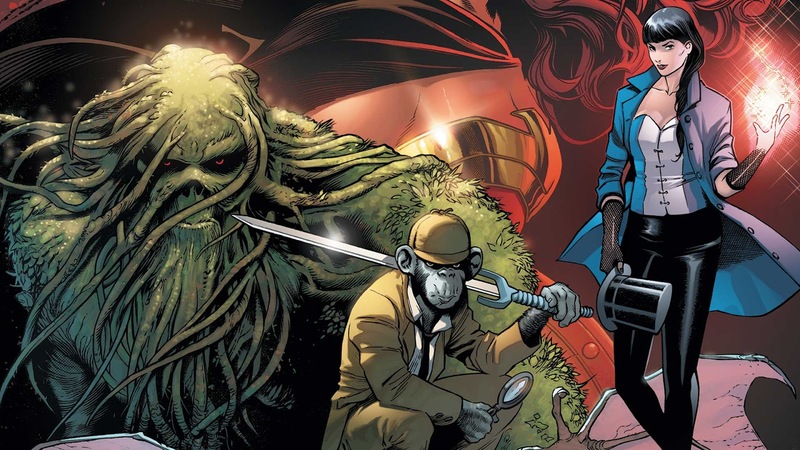 The team will consist, at least, of Wonder Woman, Detective Chimp, Zatanna, Jason Blood/Etrigan, John Constantine, and Swamp Thing. And it looks like Traci 13 might show up, once she’s done tending bar in that pocket dimension. 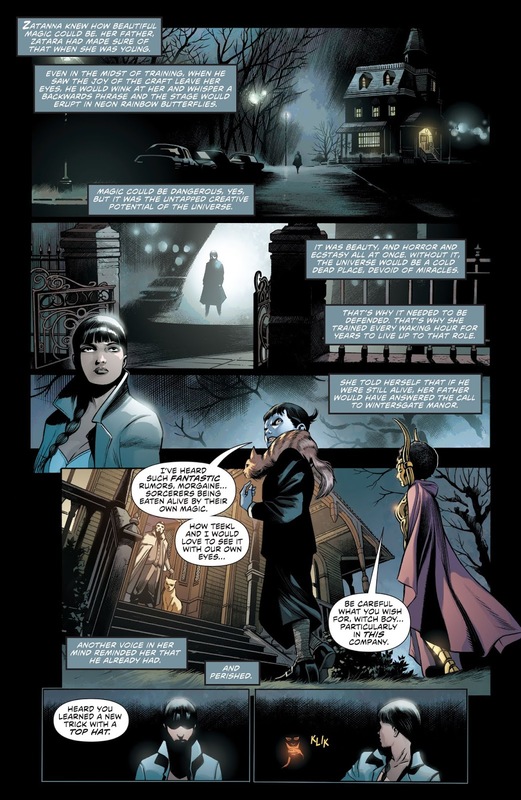 There is a dire threat, one which is mutating and then reanimating corpses, and which Zatanna’s dad, Zatara, warns her about in ghostly mind form. Really, though, we’ll have to wait until the next issue (I hope) before this series takes off properly. 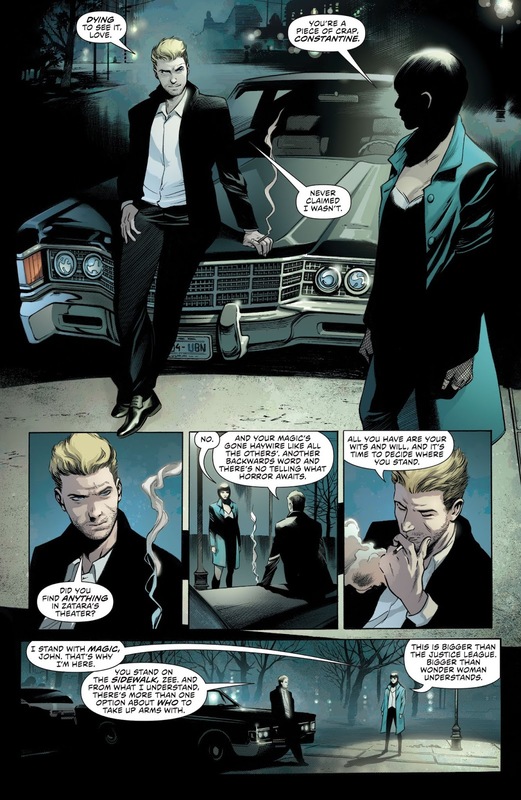 This first issue deals mainly in setting. Which, for such a spectacularly-rendered issue full of my very favorite characters in the DC Universe, is good enough for me, for now. There are some great character moments, including a terrific conversation between Detective Chimp and Wonder Woman, but it really amounts to a lot of chit-chat. The very concept of this series has me so giddy, my anticipation would probably last six issues before waning—and I pray it doesn’t have to subside due the comic book being so well-paced and enthralling. So enthrall me, already! The optics are perfect, so all you need to is execute a compelling story. Easy peasy. Wonder Woman's getting the band back together...and that's pretty much all that happens in this inaugural issue. If the idea of these characters teaming up fills you with excitement, then I imagine you'll hang on for the next few issues. I know I will. But if you think DC's magic side is silly, then you can probably skip this series entirely. This issue was a brilliant start to the reinvention of the DCUs magic universe,character interactions were on point and tension was ramped to the max. A great restart to a neglacted part of the DCU. A decent first issue, but I don't really like any of these characters except Zatanna. 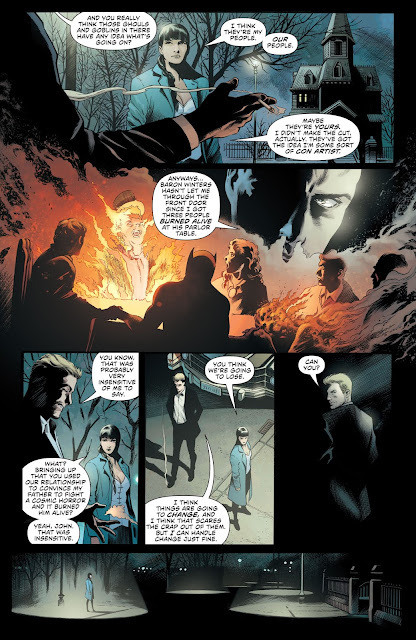 Man-Bat seems really forced into this team for No reason, especially considering the whole point of detective chimps purpose is intelligence gathering and research. The book didn't sell me for the first issue, I'll give it 2 more issues to get me invested.